Lowdown: The story of how the French gave away most Parisian Jews to the Nazis. The Round Up, or La rafle in its original French title, is a close relative of Sarah's Key. Both were made around the same time, both are there to tell the same story. Yet the two films tell their stories differently; one is intriguing while the other reverts to cliches. One is mature, the other feels like a relic of old cinema that managed to make it through the to 21st century. In too many ways, The Round Up feels like the forgotten brother of the much superior Sarah's Key. The Round Up tells the generally neglected tale of the rounding up of Paris' Jews during 1942. Those Jews, mostly of French citizenship, were collected not by Nazi hands but rather by French hands. They were then held up in a facility lacking sports stadium for a few days without much in the way of supplies, until they were eventually transferred to special camps on French territory. If you don't know your history and are afraid of bloopers skip to the next paragraph before reading the rest of this sentence: At those camps the Jews were eventually handed over to Nazi hands and transferred to Poland. All of those transferred were gassed to death. It is obvious The Round Up is aimed primarily at French audiences, trying to tell them the story of how some of them were wronged by others of them. The problem is the way the story is told: we have very basic characters, none too developed, none with much of a dark side. We are obviously meant to attach ourselves to them yet things feel too tacky for that to happen. The school like lesson in history is made mildly bizarre by cut off scenes featuring a less than convincing Hitler as he discusses French Jewry. Don't get me wrong: the history lesson behind The Round Up is an important one. One only needs to look at Eastern Europe, where Jews made a significant part of the population yet are hardly mourned, with the locals regarding them separate to "real citizens", to appreciate what The Round Up is trying to do with French perceptions. 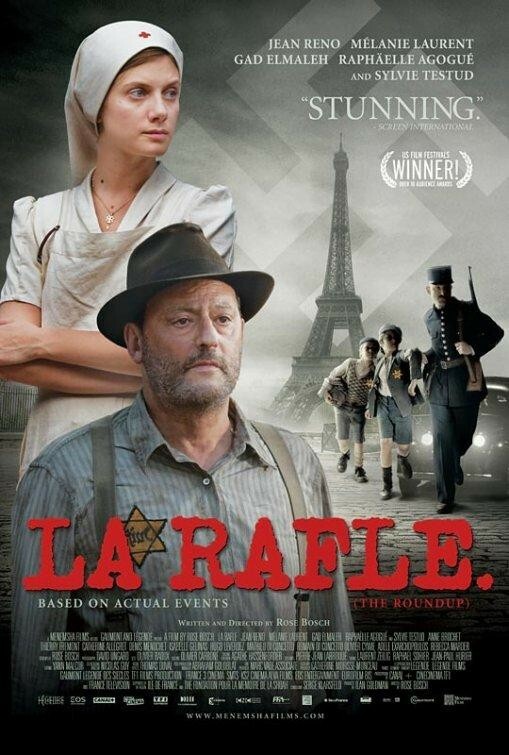 The participation of A list French stars (Jean Reno, Mélanie Laurent), some of them favorites of mine (Gad Elmaleh) helps but fails to make this one a good film to watch. Notable scenes: The various scenes depicting toilet situations are noteworthy. On one hand, they show the awful conditions involved; on the other, they are clearly way too sanitized to pass as authentic. This artificial, too clean to be true nature (particularly given the subject matter - the holocaust) represents the main problem with The Round Up. Overall: Holocaust films have evolved over time, leaving The Round Up's breed far behind. 2.5 out of 5 stars.